What a joy to have a day set aside to celebrate LOVE! It causes me to consider how love has come into my life and how thankful I am to be sharing every day with another. I am conscious of how blessed I am to be sharing my life's path with my dear soulmate. Over the years we have had many hours of enjoyment, laughter, grief, tears, dreams, wonder, failure, Love and so much more. It is worth every minute of it to share it with my love! To celebrate here on my blog I am hosting a giveaway! As the two posts before have shown, I am giving away a Heart bracelet and today I am adding to it this Romantic bookmark (Image from Paperwhimsy), so once I have picked the winning name for the bracelet I will then pick the winner for the bookmark. I will pick the winning names first thing tomorrow morning. That way, those on the west coast have at least until midnight to comment. Everyone who has commented since Thursday will be entered. I am having so much fun reading all your posts. I wish I had a bracelet for each and everyone of you! Thank you all for stopping by and celebrating with me! Terri, this is gorgeous. Happy Valentine's Day to you sweetie. What a beautiful bookmark. Every detail is just perfect. Your work is inspiring! Beautiful things that you have!! Love all of them! My Goodness Terri I have had a wonderful time cayching up on your beautiful blog your jewellery is soooo romantic the colours are amazing. I love the new look blog the header is romantic and your colours are soft and easy on the eye. Love the bookmark too and thanks for popping over leaving your comments as you do. 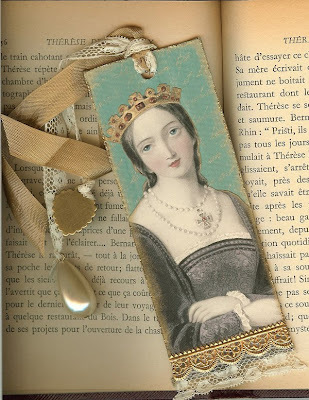 I have been admiring your bookmarks for some time now...they are lovely, and you add such great details. The winner will be a lucky lady! So nice to meet you too!!!! Your blog is fantastic! I love this Valentine's day post!! !That's great! The first word that comes to mind is ELEGANT, the next is EXQUISITE and the third is EXTRAORDINARY. Terri, your Valentine's Day card is superb. merci de ton passage chez moi ,je découvre ton blog.